Capacity - 1/8" to 3/4"
V-Taper liners for small diameter stock. Capacity - 3/4" to 1-1/2"
Without a liner, a 1" O.D. 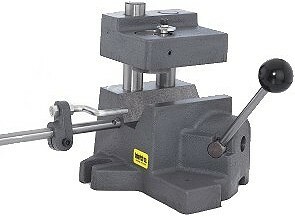 Drill Bushing can be used. .4687 to .7812 (liners straight) for 3/4" diameter stock and larger. Capacity - 1-1/2 to 2-1/2"
Without a liner, a 1-3/4" O.D. Drill Bushing can be used .9687 to 1.4062. * By use of liner, smaller bushings can be used. 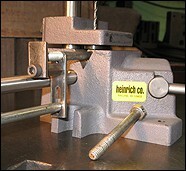 (Photo 1) The Heinrich Cross Hole Drill Jigs can make cross holes for castle nuts and safety wires. 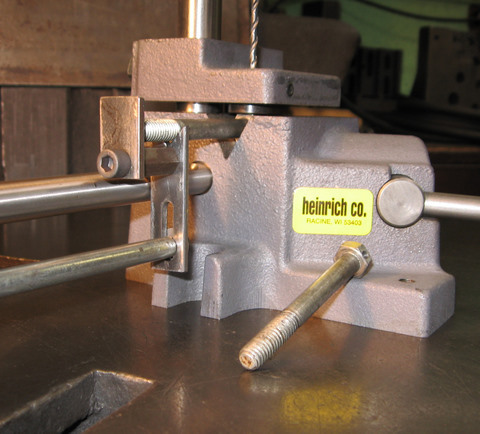 The "SF" drill bushing is held in place by a wedge, on top of the clamping plate. The v-groove in the body is hardened for longer wear. 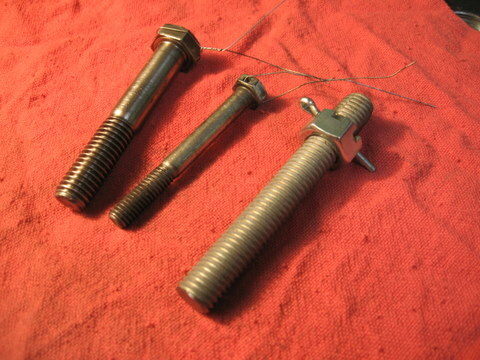 (Photo 3) Here is the smaller of the two bolts. No adapter liner is used. 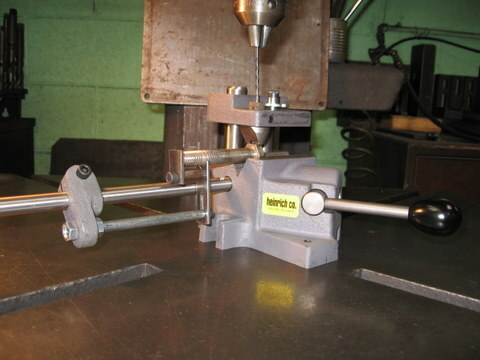 Instead, the drill bushing is placed upside down in the clamping plate. This picture shows the clamping plate up. (Photo 4) The clamping plate is down. The drill bushing is holding the head in place. The clamping plate must be raised and lowered a few times during drilling for chip clearance. The Heinrich Cross Hole Drill Jigs can make cross holes for castle nuts and safety wires. 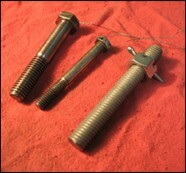 Here is the smaller of the two bolts. No adapter liner is used. 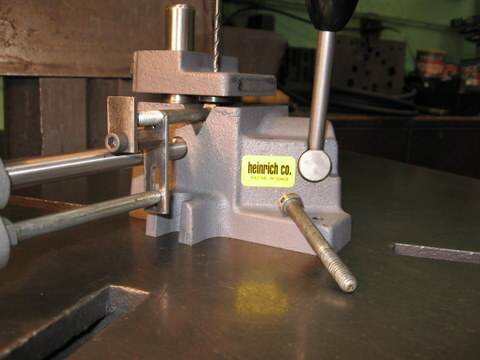 Instead, the drill bushing is placed upside down in the clamping plate. This picture shows the clamping plate up. The clamping plate is down. The drill bushing is holding the head in place. The clamping plate must be raised and lowered a few times during drilling for chip clearance.